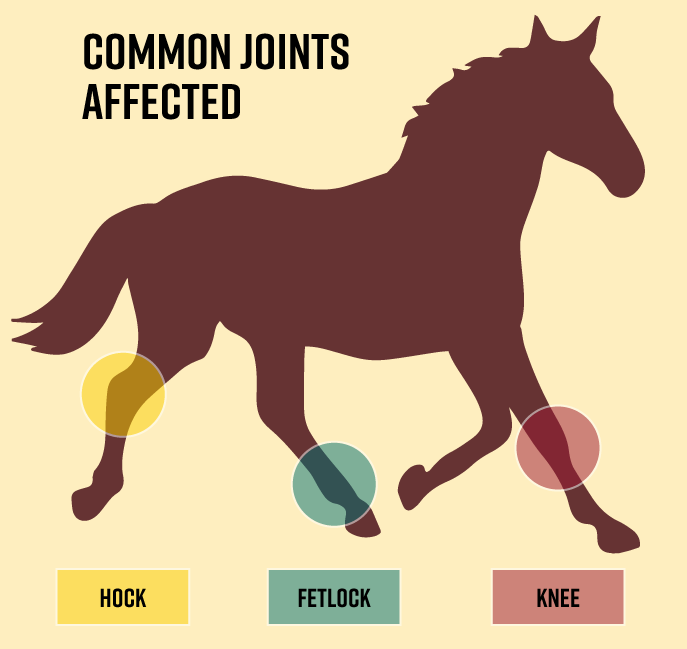 Osteoarthritis (arthritis) is a very complex disease that affects a large proportion of the horse population. Because of this, joint support for horses is extremely important regardless of age, and type of activity you and your horse partake in. Young horses can be affected as well as older horses. There are two main clinical signs associated with arthritis: pain, exhibited as lameness, and effusion (swelling) of the joint. The two signs do not always occur together initially, but as the condition progresses both become apparent. Lameness may be subtle initially, and may present as the horse being reluctant to perform certain activities/movements, such as refusing jumps, through to overt lameness present at the trot or even at walk. Effusion of the joint results from the accumulation of synovial fluid within the joint, due to increased production and decreased removal. Based upon the severity of the clinical signs, combined with severity of changes on x-rays (radiographs), the most appropriate treatment regime can be developed. Treatment will not reverse the changes present, but is aimed at reducing the rate of progression of the disease, rendering the joint pain-free, and prolonging the athletic career of the horse. The response to treatment can be a very individual horse-thing, so it can take some time to find what treatments and management work best for each individual horse. 4CYTE™ Equine is a one-of-a-kind scientifically proven joint supplementation for the equine industry targeting all key areas of joint function. Epitalis is a patented plant extract with unique properties that helps stimulate the cartilage cells (a normal physiological function when joints are healthy) in joints thus helping to maintain ongoing joint function at all stages of life. 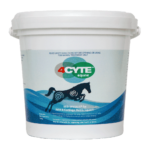 When introducing 4CYTE™ Equine to your horse start on ¼ scoops mixed with feed. Slowly increase over the first 5 days. For maintenance, the dose is ½ scoop (10.5g) per day. 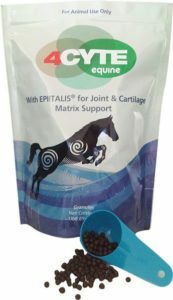 For horses following surgery or with symptoms of poor joint function it is recommended in the first 4 weeks to feed 1 scoop (21g) per day. After 4 weeks you can reduce the dose to the maintenance dose of ½ scoop daily.